We consider the addition of physically-based weather effects like haze, fog and mist to images. Most computer graphic images are rendered under clear day or night conditions and little attention has been devoted to efficiently adding realistic weather effects. 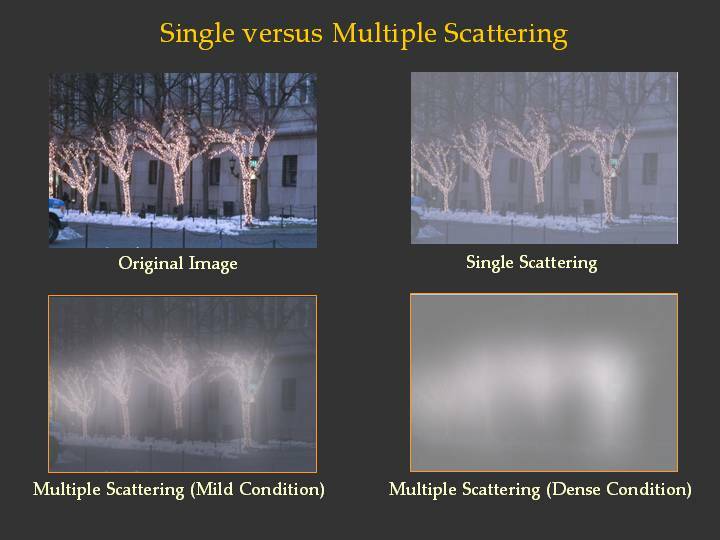 Multiple light scattering is dominant in a variety of atmospheric conditions (in general, most participating media) and is difficult to model accurately using simple approximations such as single scattering and diffusion. In the past, accurate multiple scattering simulation has therefore required very expensive volumetric Monte Carlo methods. This project focuses on multiple scattering from light sources immersed in participating media such as bad weather and fluids. We derive a new analytic formula for multiple scattering from a point light source in a medium. 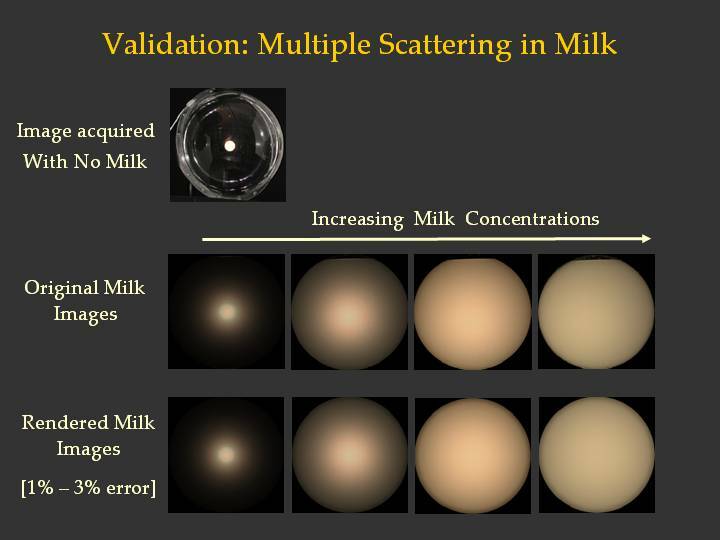 We extensively validate our model using Monte Carlo simulations as well as by using controlled experiments with a light source immersed in milk. The model accurately predicts complex scattering effects produced by a wide range of concentrations of the medium. For rendering area sources of complex shapes and radiance distributions, we show that the analytic formula reduces to a simple depth-dependent convolution of the image. This leads to an efficient implementation for adding realistic glows around sources. We demonstrate fast and accurate addition of weather effects to real photographs. Although we focus on atmospheric effects, our results can be used to render sources in virtually any participating medium such as smoke, tissue and blood. "Shedding Light on the Weather,"
Vol. I, pp. 665-672, Jun. 2003. The multiple scattering model enables us to recover from a single image the shapes and depths of sources in the scene. In addition, the weather condition and the visibility of the atmosphere can be estimated. 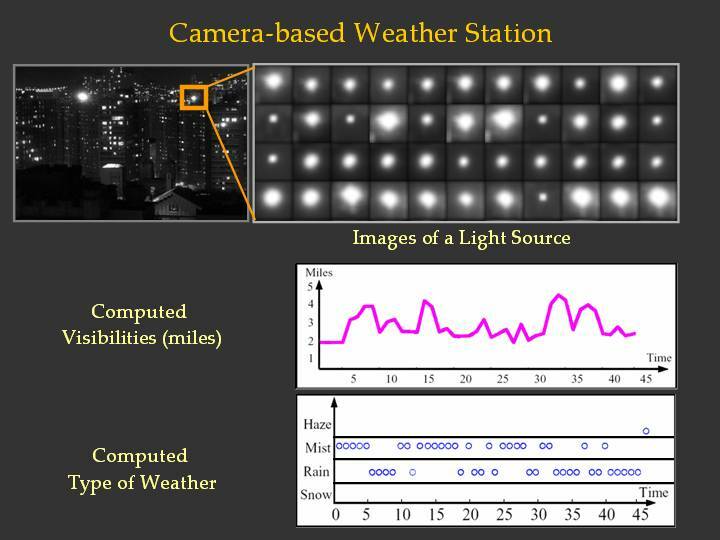 These results demonstrate that a camera observing a distant source can serve as a "weather station." This picture shows the results of adding weather effects to photographs. On the top right, the result of applying the single scattering model (attenuation from the scene and airlight from the environmental illumination) is shown. 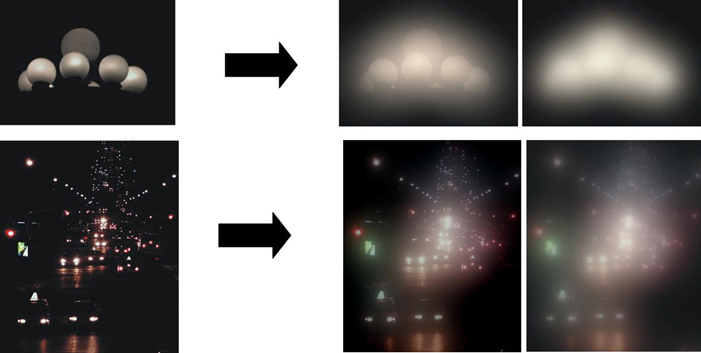 The bottom row shows that more realistic results are obtained when multiple scattering effects from light sources are added. This picture shows the experimental setup and validation results. The setup consists of a spherical container made of transparent plastic with a small diffuse source at the center. The container is filled with milk diluted to different concentrations by adding water. Results show good correlation between the renderings with our model and the actual photographs.